It is a longstanding tradition that Metropolitan Lawrence Huculak visits the children at the Ukrainian Park Summer Camp in both the first week and second week as the participants change. The first group this year was the older children teens, while the second week is the week for the younger children. During these visits, the Metropolitan invariably will celebrate a Divine Liturgy in the beautiful St. Volodymyr wooden church at which he always preaches a special sermon for the young campers. He is usually accompanied by a priest that works in the chancery who concelebrate and help distribute Holy Communion. This week the Chancellor Fr. Michael Kwiatkowski came for the visit. Last week it was Fr. Yaroslav Buduykevych. There is also no lack of altar servers as boys from the camp are always eager to volunteer. The children really do sing brilliantly – responding loudly and clearly both in Ukrainian and English. Their rendition of Bortniansky’s Blessed be the name of the Lord (Bud’ im’ya Hospodnye) was an unexpected surprise. Following the Liturgy, there is always the group photo with all the campers, including the staff, posing in the coveted t-shirt! The design of the t-shirt changes every year so everyone is excited to get one as a life-time memento of their great camp experience. The cinematography/filmmaking theme of this year’s camp was printed white on black, “Lights! Action! Camp!” Apparently the children engaged in the whole process of making films… script writing, rehearsing, filming, directing, producing. They had an Academy Awards-like gala night where the winners received not a golden ‘Oscar’, but a golden… Pysanka. Following the church service, everyone makes their way to the dining hall for a great camp meal. Food is prepared by Bill & Olga Katerynuk and Tetyana Pokeza this year. [Today it was a choice of soups, grilled cheese sandwiches, and fresh-cut melons – all you can eat… and some could really put it away!] There was a special treat today as Fr. Peter Chorney and Fr. Isidore Dziadyk, OSBM, paid a visit to the camp and brought ice-cream for everyone. The camp director this year was Joan Lewandosky who organizes practically all aspects beginning months in advance. Helping her are a number of individuals, including Sister Ruth Aney, SSMI who was there for both weeks again this year, an onsite nurse, etc. Joan also manages to put together a sizeable group of young Counsellors every time. Because of the Camp’s program of training ‘Junior Counsellors’ every year in anticipation of the next, they are always ready. One element of the visit to Ukrainian Park every year is the visit to the Plast and SUM camps that also have their dorms and camp sites within the park. 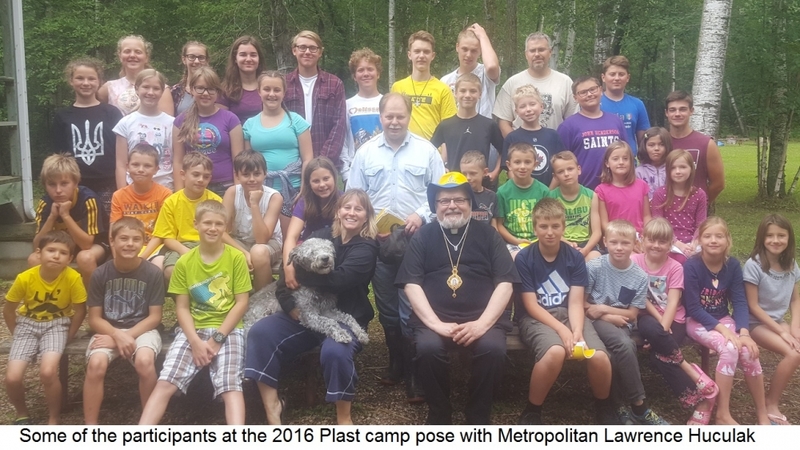 This year Metropolitan Lawrence was able to visit the 2016 ‘Plastovyj Tabir’. Its always an inspiring event as the language of the camp is Ukrainian and they always choose a fascinating theme to engage and teach the children and youth that attend. This year they were exploring Ukrainian pre-Christian paganism and spiritism that eventually was supplanted by the advent of the Christian Faith – especially ushered in by the Grand Prince St. Volodymyr. This year they sang a few songs for Metropolitan Lawrence and he engaged them with some questions about their experience. They explained that as part of their outdoors skill enhancement, some of the older Plastuny make a trek into the forest with whatever supplies they require and they camp overnight in the wilderness. Some camps give awards at the end of the camp – some in all seriousness and sometime some awards are given in good fun. Well if Plast has that practice, there is no doubt that the “most popular camper” award would certainly go to the camp dog that obviously delighted all the children and was comfortable with them all.